(A day later than anticipated, apologies. I blame the Hedge.) 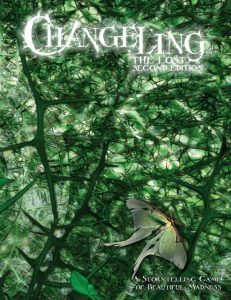 Changeling: The Lost 2nd Edition can be purchased on DriveThruRPG. She threw a decorative museum-store pillow at me. “Warhol was just dodging. I think he liked trying to get interviewers to put words in his mouth. Like it was more fun for them to invent an opinion for him.” The cashier rolled her eyes and pointedly looked at the pillow lying on the ground. I picked it up and pretended to be fascinated by the certificate of authenticity. Hand-crafted, disenfranchised women, traditional techniques, something something organic. We both knew I wasn’t going to buy it, but now it was my responsibility to put away. By almost done she meant chatting up the cashier I guess, but I could look starving and pathetic just as well while splayed across the glass door leading out to the street. It was rattling a little in the wind. The rain had abated enough to merely be pelting the sidewalk, rather than cracking against it hard enough to pit the surface. The bus would be moving slowly enough that we might still catch it, but we’d get soaked on the way there. Then June started twirling her hair at the cashier, and I started hauling her to the door. “June, it’s pouring, we need to go now.” Far in the distance I could hear thunder rolling, and the lights dimmed for a moment. The cashier coughed delicately. “We’re closing in a few minutes anyway, you should probably try to catch that bus.” And then June expired, dropping to the gift-shop floor muttering incoherent apologies, and I had to drag her lifeless corpse out into the rain. The neon was melting down to the sidewalk. We splashed through puddles of light and stood in the wet reflections of stoplights and didn’t speak. It was a little like the old times, where it was all we could do to keep ahead of Her and Her maidens. Quiet, quiet, flying when we could and running when we had to, sleeping under roots and in the lees of stones. My eyes always flicker a little when I’m remembering. It’s like the Hedge wraps over what’s actually in front of me, covering the world, but also filling it in. Everything feels a little more real when it’s full of forest. Everything looks a little less real when it’s covered by forest. Which is how it came to be that we ran directly into the bus we were supposed to be catching. It was a different driver than before, slow to meet our eyes, hardly seeming to notice the water we tracked in. The rain beat down on the roof of the empty bus, and we huddled together, shivering in the forced air. Maybe I dozed a little, because June was anxiously pulling my feathers and had given up whispering for chirping. The bus was still empty. The driver still wasn’t looking at us. I didn’t recognize the dirty road we were traveling down, but I did recognize that copse of trees. Function could follow story here. Pulling the cord might stop the bus, but that might also make it dissolve into foam, or take on new ghostly passengers, or the driver might finally open his eyes. Of all of us, Robin might have remembered best how to tell the dreamers from the ogres, and Summer would have seen through the trick. June and I would just need to make do. I touched the cord lightly at first, and felt the driver shudder through the floor of the bus. Then we joined hands, pulled it hard, and ran for the back of the bus. The driver howled, and the bus flexed along with his body. A giant, black-eyed mare unfurled its hooves and shook the glass from its faces. We stumbled in the waves of water slowly cascading down its body, washing over each face, catching in the valleys under each eye. We slid down its sleek legs, and June flung her pressed watercolor powder into the puddles at our feet, drawing powdery streaks into the straight bright lines cast by the neon sign at the receptionist’s window. Once we could hear sirens, never letting go, we jumped through the puddle, and fell straight through to a fire. I choked on smoke and June screamed. I’d finally unpacked my bag yesterday. I’d thought we were finally safe. Wendy had found us, and months later she still hadn’t let us go. There was school most days, and Mandarin lessons after, and only chores when they needed to be done. June and Summer were painting together. I was teaching Robin to read. Peter still held us when we woke up shivering. I only just got a home. I’m not ready to be finished. The second night after she rescued us — when the cold hadn’t quite left my bones, when I still wasn’t used to my new name — I asked Wendy why. She said she didn’t even think, when she found us hiding in the bog. Didn’t stop to justify it to herself, to explain why she should run or come closer. She just knew that she had to pick us up and take us home. Peter didn’t leave us, even when he knew he couldn’t protect us anymore. Wendy didn’t leave us, even when she found out what we were. I can’t leave them, either. I rubbed at the smoke in my eyes and ran towards the fire, trusting June to follow. I didn’t even think.